Heat oil in Dutch oven pan. Add onions, bell peppers and Jalapeno and saute 5-7 minutes until softened; add garlic and saute 1 minute more. 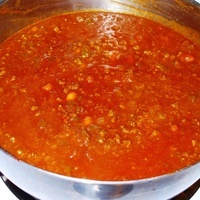 Stir in ground meat and cook stirring frequently until meat is thoroughly browned. Add beans and heat though. This is easy to make and fantastic! I used 1 lb ground beef (85% fat) and 1 lb sweet Italian sausage. I also used a 12 oz can of tomato sauce and substituted the pinto beans with one can of kidney beans and one can of chili beans unrinsed and used the whole can. I let it cook for eight hours is a crock pot and it was fantastic!! Another good chili recipe that i can try. I agree with Bob, this is similar to chili made when I was growing up in Kansas. Great stuff. This chili is very similar to one my Mom made for the family during the winter in Nebraska when I was a kid. Nothing like a hot bowl of chili on a snowy winter day. I'm sure to make your version and certain it will bring back fond memories of childhood. Thanks for sharing! Looks delicious. Will be popular in the upcoming cold months this winter, no doubt.